A group of 10 to 12 people gathered on the third floor of the San Lucas United Church of Christ Sunday afternoon, not for worship, but for political action. After making selections from a buffet table full of coffee, donuts and mandarin oranges, they assembled to discuss strategy. Their plan was to canvass the Humboldt Park neighborhood to inform people about a local ballot referendum concerning charter schools. Malcolm Washington, 20, seated on a couch, was one of them. The Humboldt Park resident is planning to vote on Tuesday, but isn’t overjoyed about his choices. “I feel terrible,” said Washington. “I feel like no matter who is elected, they will not be as equipped as I would like to deal with some of the problems that I see the country barreling towards. Washington is a member of two important voting blocs: black and millennial voters. After seeing how these demographic groups overwhelmingly voted for then-Senator Barack Obama in 2008 and helped to propel him to the White House, politicians have increased their efforts to reach these voters. The results of this endeavor have been mixed. Frequently, Hillary Clinton’s attempts to connect to black and young voters were viewed as pandering or insincere. As of late, Donald Trump’s main method of reaching black voters is declaring the inner city unsafe and proclaiming to be the only one who can fix the problems there. Vermont Sen. Bernie Sanders, an Independent who ran for the Democratic nomination, did manage to ignite the passions of many young voters, but even he fell short of recreating the enthusiasm Obama engendered. Washington was a fan of Sanders, but he never fully considered himself a part of that movement. Despite his reservations about the slate of candidates on the ballot this election season, Washington voted early and did finally pick a presidential candidate: Clinton. Clinton has not been quite as successful as Obama at wooing black voters, especially millennials. Among African Americans age 18 – 30, 80 percent expressed their likelihood of voting for Clinton, according to the most recent survey of the Black Youth Project with the AP-NORC Center for Public Affairs Research. Conversely, Obama 91 percent of voters in that demographic expressed a preference for Obama in 2008, while 95 percent favored him in 2012. 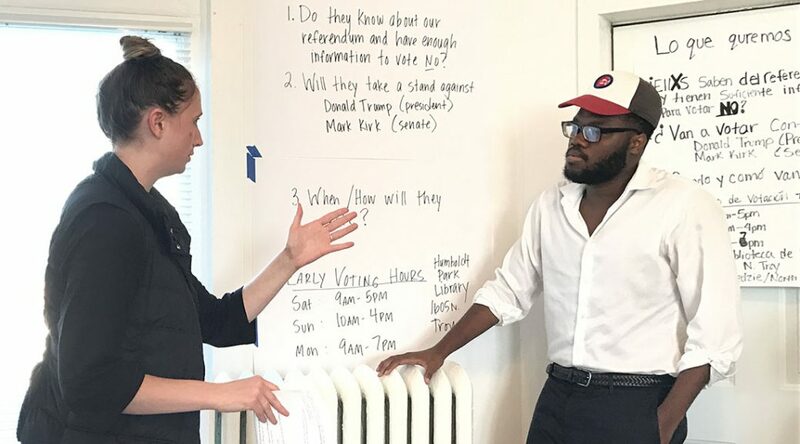 “With black millennial voters, the identification with Democratic Party is not quite as strong as with other black voters,” said Michael Dawson, the director of the Center for the Study of Race, Politics and Culture at the University of Chicago. He added that mobilizing black millennials to polling stations will be a major challenge for Democratic Party. Effectively addressing the issues that concern black millennials would be critical for the Clinton campaign, particularly when young adults are not particularly passionate about her. Creating jobs that would enable millennials to achieve a decent standard of living would be one thing to focus on, Dawson said, adding that some might argue that the economy has not rebounded since 2008 for African Americans, and for many, it may even have gotten worse. The wage gap between black and white Americans actually has increased since the Great Recession, with African-Americans earning 23.9 percent less than whites in 2007 and 26.7 percent less last year, according to recent research by the Economic Policy Institute. The murky economic situation unsettles some young adults. Shari Holliday, 31, also attended the canvassing meeting. She said her biggest political concerns are about the economy. “Jobs, housing, things like that”, she said when asked what issues are her highest priorities this election season. Holliday said she wasn’t optimistic about the election, but she planned to vote. Her choice for president, she said, was obvious. “I’m not gonna vote for HIM!,” she said with a laugh. Dealing with police brutality is another issue that animates black millennials, and many have taken note of what the candidates have been saying on the subject. Trump’s rhetoric about violence in black communities and his insistence on bringing back stop-and-frisk, a divisive policing policy, have alienated him from many black voters. “All of those policies that are being promoted [by Trump] would be anathema to black millennial voters and black voters more generally,” said Dawson. Still, there is doubt about Clinton’s commitment to social justice issues as well. “Black millennials are very skeptical that the Clinton campaign will actually follow their programs,” Dawson said, adding that Obama could be “marginally helpful” in terms of generating black support for Clinton. It is unclear, however, whether that support will turn into actual votes. It is a skepticism fueled, in part, by the fact that many black communities are still stinging from the effects of the 1994 crime bill passed by former president Bill Clinton and eagerly endorsed by then first lady Hillary herself. That bill, according to many, resulted in the mass incarceration that some, like author and Ohio State University law professor Michelle Alexander, say hollowed out black communities. “Bill Clinton championed discriminatory laws against formerly incarcerated people that have kept millions of Americans locked in a cycle of poverty and desperation” Alexander wrote in The Nation in February. And critics, like Alexander, hold Hillary Clinton just as culpable for those policies as her husband. But despite misgivings about the candidates, many millennials still feel that it’s important for people to be informed and to vote.